1871 Says: Andy Crestodina, Founder of Orbit Media, will be featured as the keynote speaker on March 22, 2016 at 1871 as a part of the Chicago AMA series, where he will be covering the content of this post and much more! Learn more about this event by checking out Applied Analytics: Insights and Actions from 12 Reports. Starting from zero is hard. Young websites don’t have a lot of traffic, so there isn’t much website data to analyze. But that doesn’t mean Analytics are less important. It means they are more important. Every little insight can be useful. And those insights are there in your Analytics, but only if you have it setup to tell the story. Analytics will always tell you a story. But you have to set it up properly if you want it to tell you a true story. By default, Analytics doesn’t know what success looks like. You have to tell it what interactions are your desired outcomes. You have to tell it the web address of the “thank you” page. That’s the page that the visitor arrives at after they become a lead, become a member, apply for a job, etc. Do this from the Admin section under the View > Goals. Once the goal is set up, you’ll be able to measure what kinds of traffic are likely to lead to success. You can also see the relative effectiveness of every action you take in marketing. Very valuable data! 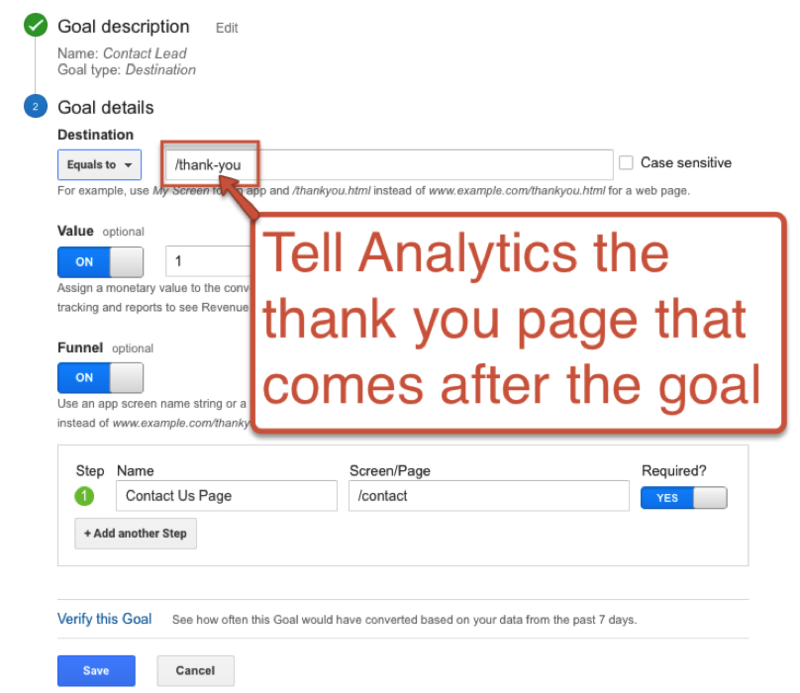 Note: to properly set up the these goals, your website needs to have a separate thank you page, with it’s own URL, not just a thank you message. 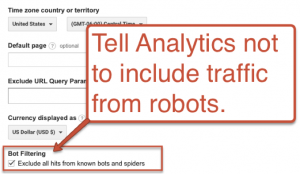 When traffic is low, Analytics data can get polluted very easily. The most common problem is having traffic from your own visits showing up in there, mixing together with the traffic from your audience. To fix this, you need to create a filter. 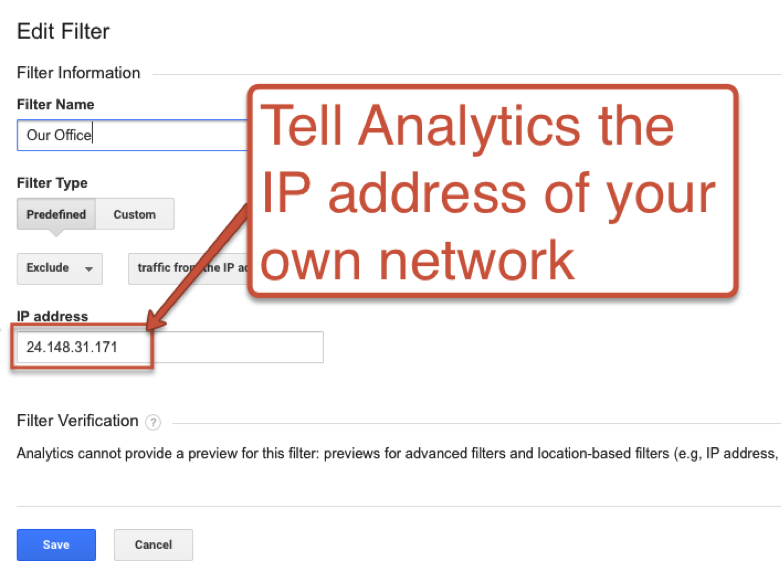 When you tell Analytics the IP address of your network, it can filter out this traffic, so you no longer appear in your own data. Do this from the Admin section under the View > Goals. Once this filter is created, your data will forever be more accurate, making every story told by Analytics more true and every action more likely to be effective. 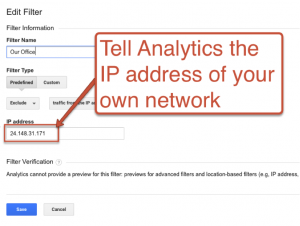 Note: to properly set up filters, you’ll have to have a “static IP address” which means the IP address doesn’t change. If you have a “dynamic IP address” you can consider filtering out all traffic from your ISP, but this may remove some traffic from your audience! For sites that have very low traffic, visits from robots, such as GoogleBot can skew things quite a bit. These little fake visitors often show up as “referral traffic” and they are not relevant to any kind of website analysis. You should remove them. 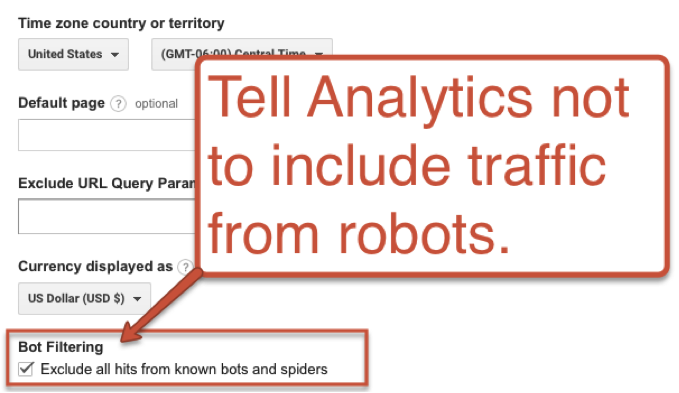 Analytics doesn’t exclude them by default, so you have to check a box in the Admin area, under View > View Settings. It looks like this. Once this exclusion is create, your referral traffic will be more accurate, giving you a better view into who is sending you how much traffic. Startups get press, leading to huge spikes in traffic. Or they make website changes, which can cause big drops. The ups and downs of marketing are there for the team to see, but it’s hard to share (or even remember) what happened and when. Adding annotations to your timeline makes it easy to record those big events. It only takes a second and it’s helps tell the story. Just click that little tiny arrow below the timeline and then click + Create New Annotation. Now add the note! Once annotations are there, it’s easier to collaborate with new people as your marketing teams grows. Finding the true story buried in your data is hard the first time. Once you find it, don’t lose it or you’ll have to look it up again. 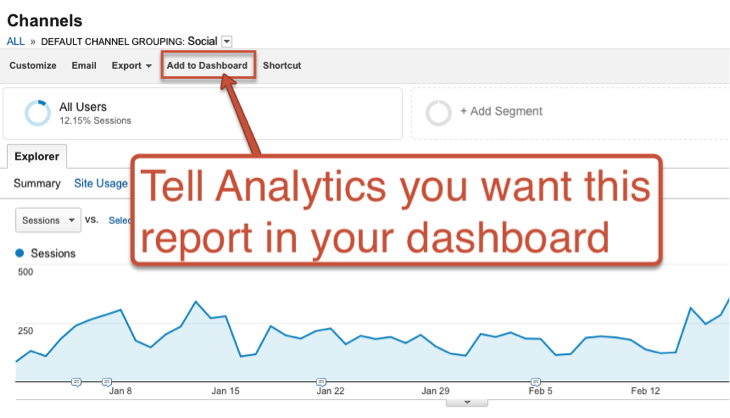 To add reports to dashboards, just click the Add to Dashboard link at the top of any report. You can add it to a new dashboard or add it to one you’ve already created. ProTip: There is a gallery of hundreds of dashboards created by Analytics experts. It’s called the Solutions Gallery. 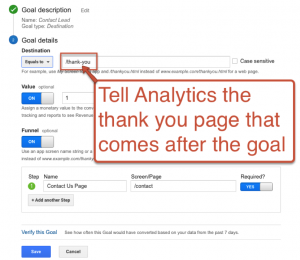 You can add any of those to your own Analytics with a single click! 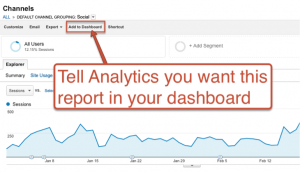 Once you have all of your favorite reports in one place, you’ll be faster at finding insights. You can even have Analytics email you the dashboard as often as you like, so your data is coming directly to you. Once things are all setup, you’ll have better data, and you’ll be more efficient at finding those true stories in your Analytics. It’s the actions you take from these stories that will drive your marketing, grow your audience and make your startup a success. For step-by-step instructions, see these 5 Videos Showing How to Setup Google Analytics on the Orbit blog. For a deep dive into how to use Analytics for true marketing analysis, come to Applied Analytics: Actions and Insights from 12 Reports at 1871 on March 22. Space is limited. Andy Crestodina has been in the web design and interactive marketing space since January of 2000. In that time, he's helped thousands of people do a better job getting results online. He's a true evangelist for content marketing and ethical digital marketing.